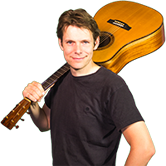 I've been a private guitar instructor, online educator, youtube, composer/arranger, and musician for about 20+ years. I released a few Latin Jazz albums, one of which made it to the jazz album charts in the US. I've studied at the Hilversum Conservatory (currently located in Amsterdam) and at the Rotterdam Conservatory where I graduated for my 1st phase (bachelor - jazz) and my 2nd phase (master - world music). For 3 years I did 2 separate bachelor studies, one for Jazz Guitar, the other for South American Music. Over time I've worked on very diverse music projects of which most notable are: Panchito (Latin Jazz), Sexteto Canyengue (Tango Nuevo), Janine Jansen/Carel Kraayenhof (Tango Nuevo). In the Netherlands I received special "composition grant" on the basis of the success of Panchito's debut album "Resurreccion". The grant was used to write the compositions for Panchito's second album called "las ultimas canciones"
Currently I write guitar courses which are featured on my website: Yourguitarworkshop.com. The website is linked to my youtube channel "yourguitarworkshop" which is rapidly growing in popularity. Even though I have been involved in many different styles and studied Jazz and South American music, I have never lost contact with where it all started: Rock/Blues/Metal.